Back Stage Books, 9780823088324, 192pp. 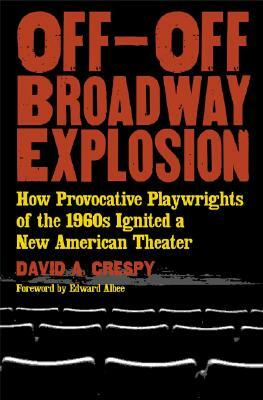 The off-off-Broadway movement of the 1960s remains one of the most dynamic periods in the history of American theater. Filled with one-on-one interviews and entertaining anecdotes, Off-Off-Broadway Explosion explores the backstage stories and captivating history of the unusual venues and legendary personalities of the era. Readers will discover intimate accounts of the innovative Beat Generation playwrights who transformed the New York stage, such as Edward Albee, Sam Shepard, Lanford Wilson, Amiri Baraka, Jean-Claude van Itallie, and many other artists whose legacy is still felt within theater halls today. They’ll learn about the Greenwich Village visionaries who allowed emerging playwrights to showcase experimental works not welcome on the traditional stage, such as Joseph Cino, the wildly eccentric papa who sired Caffe Cino, and Al Carmines, the radical minister of Judson Memorial Church, whose Judson Poets’ Theater was known for the avant-garde musicals conceived by the pastor himself. Finally, a special chapter, “Your Own Off-Off-Broadway,” advises today’s playwrights and theater artists how give voice to their own work and find progressive audiences to appreciate it.